Vimeo takes the third spot in terms of popularity among video sharing sites. It ranks behind YouTube and DailyMotion in giving users around the world a good place to upload, store, and share their videos over the worldwide web. Vimeo provides different tools for editing and managing videos. The site also supports many formats to make a user’s video sharing experience very much worth it. Don’t know how to upload movies to Vimeo for sharing with your family and friends? Here, you will find the best solution to upload DVD to Vimeo. Depending on your type of account, there are many file formats that Vimeo supports. Vimeo recommends videos that use the H.264 codec. MOV and MP4 files are two of the most common files uploaded over at the site. AVI and MKV are supported as well. When you try to upload video files to Vimeo, an error message will show up if the file comes in an unsupported video format. Since DVD is not included in the list, in order to share your DVD movies on Vimeo, you have to rip DVD to Vimeo friendly video formats using a DVD ripping program. 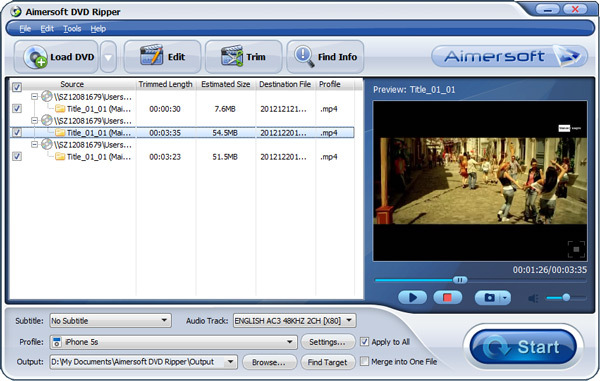 Aimersoft DVD Ripper is an excellent DVD ripping tool. It can help you convert DVD to supported video formats without losing much quality. To make it easy for you to convert movies in DVD to Vimeo supported format, Aimersoft DVD Ripper offers optimized preset for Vimeo, you can rip DVD to Vimeo in a simple click and no need to worry about the format compatibility. With a built-in video editor, you are able to change the DVD movies according to your taste, you can add watermarks, remove subtitles, change video visual effects and more. Besides, Aimersoft DVD to Vimeo converter provides an easy access for you to fetch DVD video metadat. No matter TV shows or movies, you can get their information like director, actors, description, release time, genre, etc. with a simple click. If you are a Mac user, please turn to Aimersoft DVD ripper Mac to convert and upload DVD to Vimeo on Mac (including Mountain Lion and Mavericks). Now download the right version of the program and follow the guide below. Tip: Basic Vimeo users can upload 500MB videos a week while VIP users can upload 5GB videos a week. 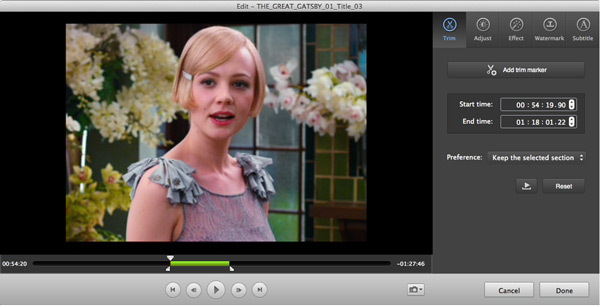 So please pay attention to the video size when ripping DVD movies for Vimeo. To get the very part of the video files you want, you can either just choose to rip the chapters you like to share or click "Edit" to trim the DVD videos. Next, specify the output video format. You don't need to be confused about what format to choose. Video preset for Vimeo has been provided. Just click "Profile", go to Online Video category and set "Vimeo" as your output video format. After the above two steps, go back to the main interface and click the "Start" button to begin converting DVD movies to Vimeo highly compatible MP4 video files. When the conversion is done, click "Find Target" to locate the ripped videos and upload them to Vimeo with ease! Install Aimersoft DVD Ripper for Mac and launch the program. Insert the DVD disc that you want to rip into the Mac DVD drive. And click "File" > "Load DVD Files" to import the DVD movies into the program. Now you need to choose an output format for the conversion. Here the optimized preset for Vimeo as the desired format. As you can see, there are many other ready presets for YouTube, Facebook and various online video output. Just choose the one you need. Now you can begin the DVD to Vimeo conversion by clicking the Convert button. Once you do that, the conversion will begin automatically and finished in a few minutes. Just sit back and drink a cup of coffee to waiting the conversion done. When you get the ripped DVD movies, upload them to Vimeo as you wish. Step 1. Make sure that the video file you own falls under the Vimeo file supported formats. If it doesn’t, you’ll have to convert them first. Step 2. While logged into your account, go to the My Videos Tab and upload videos from there. Or look for where it says Upload in order to add videos directly. Click on ‘Choose a Video to Upload’ button and browse through the video file on your hard drive. Vimeo also supports mobile uploads, uploads using the desktop app, or uploads via Dropbox. Step 3. Wait for the file to be completely transferred into Vimeo’s server. Check the status bar on your screen. Once it is done, you can check on the My Videos tab again to see if the video you just added shows up there. That indicates that the upload was successful.